For five seasons, ex-Swedish international Oscar Friberg has been in charge of Ostersunds FK. In those years he’s built his own squad of youthful talent. The core of his side are mostly under the age of 25; four of the five highest appearance makers in the 2021 season were 21 or below. But you can’t win anything with kids. Can you? In this post we will review Friberg’s fifth season as a manager. The popular manager was approached to manage a nation back in 2020 and he accepted. How has Friberg performed in his first year as an international manager? Mentioned earlier was the fact that Friberg has rejuvenated his side with a host of young players and these youngsters have formed the core of the Ostersund side over the past season. These 7 players have been incredible this season. Rui Santos has been with us for two years now and is under constant pressure to move to another club. Right wing-back Cristian Cozma joined on loan from PSG at the beginning of 2021 and was a great addition to our defence. Ken Sasaki, a Japanese newgen, was brought to the club at the beginning of the 2021 season and prompted a change to the Dutch 4-3-3 tactic we had employed for the past few seasons. Swedish international Gabriel Gudmundsson is a tremendous player for us. With the requirement of having at least 9 homegrown players (in the nation) per matchday squad, having Gudmundsson in the starting XI week-in-week-out is essential to our success. Attacking midfielders Angel Gomes and Goran Kozar provide the creative spark that we need in our offensive phase. In front of these two is Daniel Zermatten. The Argentinian hot prospect is on loan from Boca Juniors but will be leaving at the end of the season. Last year we saw how Ostersund reached the Swedish Cup final but lost to eventual Swedish champions Norrkoping. This year, Oscar Friberg and co will be desperate to right last years’ wrongs. Ostersund have astounded critics by reaching yet another Swedish Cup final. And, as if a mark of their determination to avenge last years defeat, they’ll face 2020 victors Norrkoping who reached the final too. Below is a Twitter thread that shows in detail the Swedish Cup final as it happened. Ostersund lost a second final in a row to Norrkoping, meaning that the Swedish champions have now won three consecutive Swedish Cups. 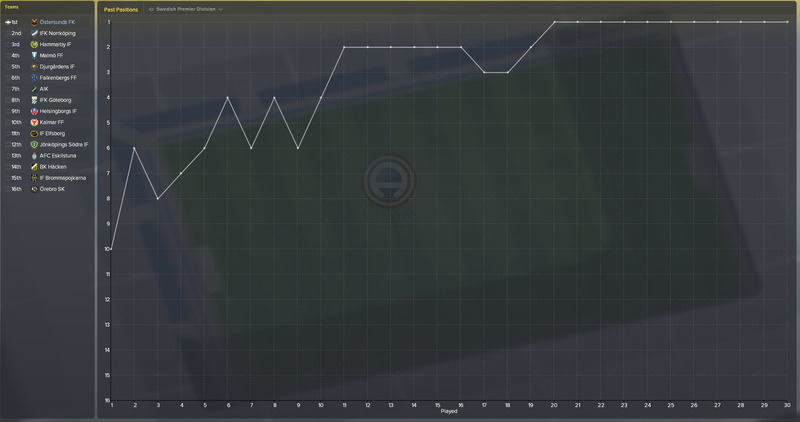 As a result of our incredible revival last season to earn 4th, we qualified for the Europa League 2021/22 qualifiers. 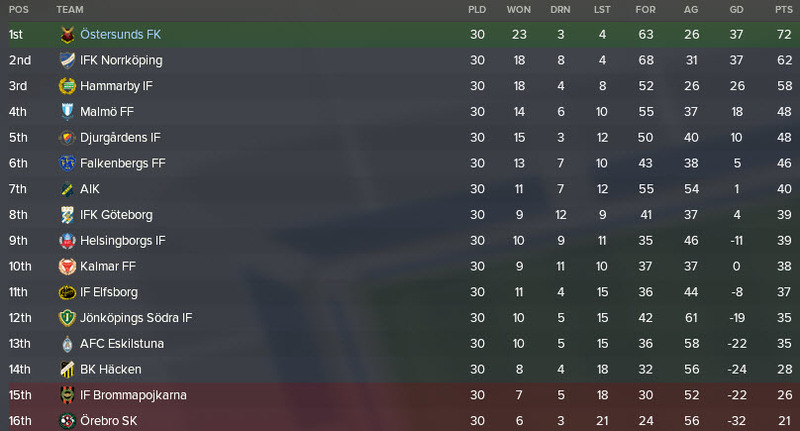 As you can see from the image above, we have progressed through to the Europa League group stage for the second season running. Ostersund faced Debrecen, Mlada Boleslav and Heerenveen on the way to the Group Stage and will be happy with their progress. Ostersund have been drawn to face Zenit St Petersburg, OGC Nice and BATE Borisov in the groups. Ostersund have begun the league season in great form. From the opening 15 matches, we’ve won 11, drawn 2 and lost 2 which leaves us in 2nd place behind Hammarby. Our only defeats came away to both Malmo and Goteborg and we also dropped points to Helsingborg and Norrkoping. Oscar Friberg must be delighted with the progress shown by his Swedish club. Ostersund have won five of their six Europa League group matches, losing only to second place Nice away from home. A brilliant 3-0 away win in Russia set the tone for the group and we pushed on to top the table on 15 points. In the second half of the league season we won two more points than the first half. A real turning point came against Malmo where we scored THREE late goals to overturn a two-goal deficit to win. I’ll be looking at the impact of our late goals later on in this post. But where has this impressive run of form left us in the Swedish Allsvenskan? Swedish Allsvenskan 2021 | Ostersund are champions! CHAMPIONS!!! OSTERSUND ARE CHAMPIONS OF SWEDEN! Oscar Friberg’s side won the Swedish top tier title by ten points as both Norrkoping and Hammarby were unable to catch them. Malmo squeezed into fourth place in a similar fashion to Ostersund last season. Our form this season has been astonishing really. With so many extra fixtures, our squad had to rotate often in order to remain fit and in doing so we proved how capable our entire squad really is. I’m going to take a quick look at a crucial part of our game this season: scoring late goals. 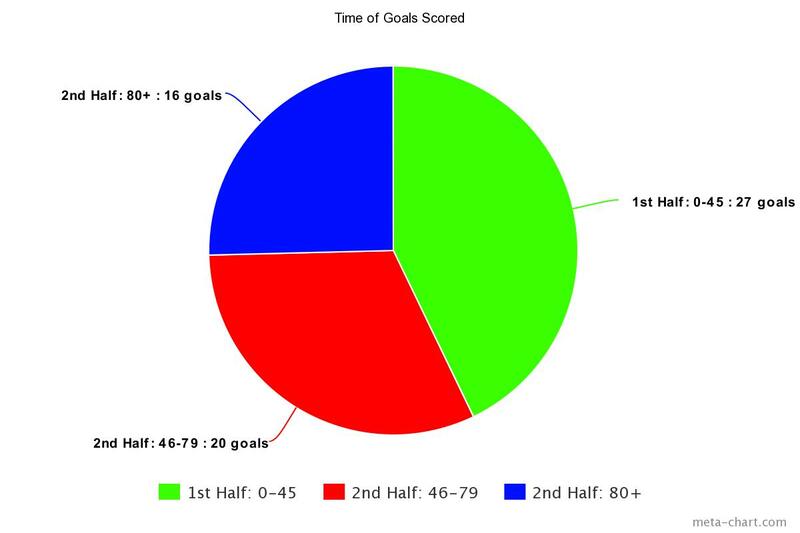 The pie chart above indicates how we’ve scored a large portion of our goals in the final ten minutes of matches. 16 of our 63 league goals this season have come after the 80th minute has begun. These 16 goals helped us gain 7 extra points, including 3 against Malmo and 1 against Norrkoping. It may not seem like a lot, but a loss against Malmo could have lowered morale in our squad and another poor performance could have followed. Defeat against Norrkoping would have given them an extra two points and would have added pressure to our title challenge. As a contrast, we did lose two points from goals conceded in the final ten minutes, this being the 1-1 at home to Helsingborg in the first game of the season, from then on we never dropped points by conceding in the last ten (we only let in three post 80th minute goals all season). Scoring late goals wasn’t the deciding factor of our title win, but they certainly contributed along the way! Last season, just as Ostersund’s race for fourth was hotting up, Friberg was approached by his national side Sweden to become their manager. A distraction that probably was not needed at the time, but one that could not be ignored. For a man who became a legend playing for his country, the opportunity to manage them could not be turned down. Friberg’s early form with Sweden left little to be desired. He won just one of his opening 5 games as they were relegated from Division A of the European International League. But 2021 was a much improved year for Sweden and Friberg has shown his qualities as an international manager, helping Sweden win 9 matches from 12. In doing so, Sweden have qualified for the 2022 World Cup. The title-winning season with Ostersund, alongside their successful Europa League campaign and Sweden’s form in 2021 has seen Friberg’s win percentage rise to a shade under 60. The elusive Swedish Cup victory will be in the back of Friberg’s mind, but Ostersund winning the Allsvenskan more than makes up for the defeat to Norrkoping. All is looking good for Friberg and his men. What’s next for the Swedish club? Will they be able to qualify for the Champions League group stage? Can Sweden progress to the knockouts of the 2022 World Cup? The next few instalments of our story with Friberg may well be the most intriguing yet. Thank you very much for reading another instalment of our Football Manager 2018 story here on VivaLaVidaFM. Season Five has far surpassed my expectations and I’m so excited for next year. If you enjoyed it, do leave a like or a comment, let me know what you think of our save so far. Be sure to follow me on Twitter as I will be posting many save updates there! 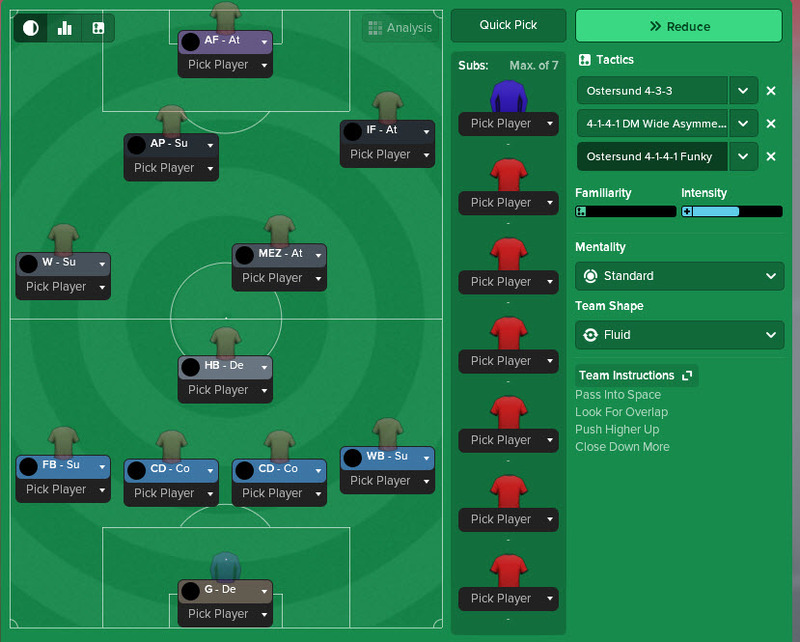 This entry was posted in FM18 Stories, Football Manager 2018, Oscar Friberg, Ostersunds FK | @VivaLaVidaFM and tagged angel gomes, europa league, fm stories, fm18, football manager, international management, Oscar Friberg, ostersund, sweden, swedish allsvenskan. Bookmark the permalink.